Over the last 24 hours, about .5 to 3 inches of rain have fallen across SLO County. 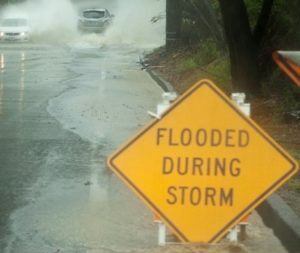 North County, which is currently dealing with mudslides and road closures, has received heavier rainfall than South County. Rocky Butte near San Simeon and Upper Torro between Morro Bay and Atascadero each received approximately 3 inches, according to county rainfall data. The South Portal near the California Men’s Colony received slightly more than 2.5 inches. Several areas in South County received less than 1 inch. The current storm has produced high winds, which have reached 31 mph with gusts up to 49 mph at Diablo Canyon, PG&E’s John Lindsey stated in a tweet. There are numerous reports of mudslides and downed trees along Old Creek Road between Highway 1 and Highway 46, according to the CHP. It is unclear if any stretch of Old Creek Road is open to traffic. Likewise, there is a mudslide in Templeton on Las Tablas Road near Booker Road. Las Tablas Road is closed between Oakdale Road and Willow Creek Road. A PG&E map shows a variety of small power outages affecting locations across the county, with a slightly larger outage in the Pismo Beach area. Early Thursday morning, the CHP responded to a single car crash on northbound Highway 101 halfway up the Cuesta Grade. The extent of the accident was unclear, but the crash was expected to back up traffic on the Cuesta Grade. Traffic hazards were also reported in Avila Beach, Los Osos and Paso Robles. In Monterey County, officials again closed a stretch of Highway 1 in the Big Sur Area. Officials closed Highway 1 between Mud Creek and Paul’s Slide at 12 p.m. Wednesday, prior to the arrival of the storm. Why were violent Paso Robles bank robbery suspects released?